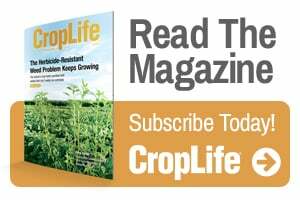 The current state of domestic ag chemical distribution cannot be fully assessed without taking stock of its biggest potential threat — Farmers Business Network (FBN). Launched initially out of Silicon Valley in 2014 as a farmer-focused, agronomic data aggregation play, in early January of 2016 the company leveraged its acreage network in a spin-off effort — FBN Direct — that at the time sent shock waves through the ag retail industry. Offering two to four day delivery windows for products, or same-day pickup from one of its 11 warehouses flung throughout the Corn Belt, Upper and Lower Midwest, as well as out in California and Montana, Direct intends to pursue direct-to-farmer sales relationships in crop protection and seed, equipment and technology, even crop consulting. Or basically, if the traditional brick and mortar ag retailer offers it, FBN is probably looking to disrupt it. And initially they weren’t interested in taking any prisoners, coming out of the gates guns-blazing with an anti-ag retail marketing campaign that the company has since seemingly backed away from a bit. Yet the aspect of FBN Direct that resonates the most with today’s commodity market-driven grower remains: a stated commitment to low, fair and transparent pricing, across the country. 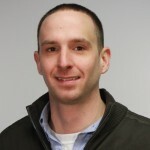 Fresh off banging the pro-farmer drum on the summer farm show circuit with its Seed Relabeling Study report, FBN VP of Product and Co-founder treCharles Baron gave me a quick update on where things are currently with Direct. 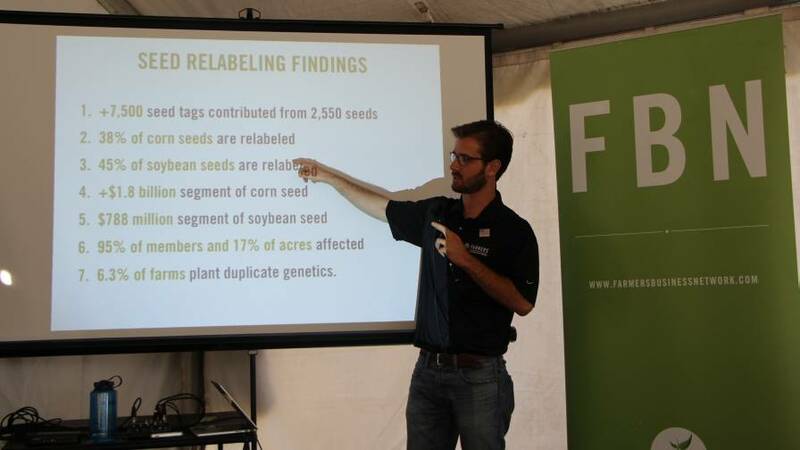 FBN’s Charles Baron presents major findings of its Seed Relabeling Study during the 2017 Farm Progress Show in Decatur, IL. One area that FBN has seemingly beaten traditional ag retail at is marketing. It’s tough to deny that FBN’s anti-big ag marketing is simple, effective, and it resonates with a portion of American farmers that have been hammered by commodity market volatility, with virtually no price relief from the manufacturing channel. One of the many aspects of FBN’s anti-channel marketing campaign is to hammer home the lack of price transparency and fairness to farmers in the current rebate-driven climate of crop protection manufacturers, as well as retailers closely aligned with the channel. Shining light on regional pricing differences — or retailers in different locations sometimes offering the same product at drastically different prices — is another area FBN has found success with. Although this author could argue otherwise based on past marketing efforts, Baron says in closing our conversation that the company is trying to get away from its anti-Big Ag perception. The Amazon of Ag Retail? Seeing as how Amazon is basically revolutionizing consumer goods retail and putting thousands of brick and mortars out of business a day, one could argue that’s not a real stinging insult. I mean, who wouldn’t want to be the next Amazon of anything? Jesse Wiant, CCA and master field sales agronomist, United Farmer’s Cooperative (UFC), for one, wouldn’t. Wiant admits that the price fairness and transparency message FBN has carries to the masses has resonated with some of the larger, more independent growers in his southeastern Minnesota trade area. Where he is most skeptical of FBN’s promises is in the data side of the coin. But what about hanging onto the growers that maybe are enticed by what FBN is offering? Wiant has found success in reminding growers the scope of resources they’d be giving up by going down that path. It’s the younger grower that will buy from FBN. Dad has always worked with the coop and his son/daughter see an advantage with FBN. They understand the data, and they don’t think service is a big deal. I manage a retail facility and see it more and more. Retail has to find a way to be of value to the next generation of customers or those customers will figure out how to have success without us. I am told that they are not following the regulatory requirements in CA – they do not have licensed Pest Control Advisors which are required by law if you “solicit ” a sale of a product. Also aware that they shipped an RUP without proper permitting from a grower. I heard the founder state at the Forbes Ag Business conference that manufacturers and distributor reps worked less than 30 hours a week and were ripping off the farmer. He indicated that manufacturer and distributor sales reps added no value to the growers. He is not afraid to make inflammatory statements.